AutoCrit is a web-based fiction manuscript editing tool for indie writers. The software assists authors in simplifying the editing and revision process with its tools that highlight concerns in more than 25 areas. They are then guided by the application step-by-step to ensure that they make changes to the key elements and make their writing more attractive to agents and publishers. 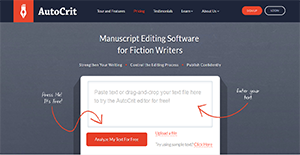 With AutoCrit, authors can even compare their manuscript to published fiction works and see how they stack up against them. This provides them with insight regarding writing styles popular among readers so they can take a cue from them and emulate them to improve their works. AutoCrit analyzes manuscripts according to six categories: dialogue, strong writing, word choice, repetition, compare to fiction, and pacing and momentum. Each section has specific areas of analysis that aids writers in editing their work for a stronger outcome. With AutoCrit, users can immediately find the areas that they need to edit as the application analyzes and highlights the exact words and sections for review. This saves them time in the process and lets them be more productive in their analysis. For authors, it is important to know how far they have gone in editing their manuscripts. That is why AutoCrit comes with Score and Fingerprint features that show writers at a glance how far they are in polishing their work. With AutoCrit, there is no need for writers to pore over everything from the beginning of the manuscript. The software analyzes the entire content and provides a summary that tells the writer where they should begin doing their edits and also provides them with precise recommendations. AutoCrit lets new and veteran authors alike to compare their manuscripts with the published fiction works of other writers. The software has a proprietary algorithm that allows authors to choose the genre with which to evaluate their story. AutoCrit helps authors ensure that their stories have a good flow word-wise. This means the software points out excessive use of particular words and suggests how many repetitions must be removed to reduce redundancy. If you are considering AutoCrit it could also be sensible to analyze other subcategories of Best Grammar Checker Software listed in our base of SaaS software reviews. Enterprises have different needs and requirements and no software solution can be ideal in such a situation. It is pointless to try to find an ideal off-the-shelf software product that fulfills all your business needs. The intelligent thing to do would be to customize the application for your special requirements, employee skill levels, finances, and other aspects. For these reasons, do not hasten and subscribe to well-publicized popular solutions. Though these may be widely used, they may not be the best fit for your specific needs. Do your groundwork, investigate each short-listed system in detail, read a few AutoCrit reviews, contact the seller for clarifications, and finally choose the application that offers what you require. How Much Does AutoCrit Cost? We realize that when you make a decision to buy Grammar Checker Software it’s important not only to see how experts evaluate it in their reviews, but also to find out if the real people and companies that buy it are actually satisfied with the product. That’s why we’ve created our behavior-based Customer Satisfaction Algorithm™ that gathers customer reviews, comments and AutoCrit reviews across a wide range of social media sites. The data is then presented in an easy to digest form showing how many people had positive and negative experience with AutoCrit. With that information at hand you should be equipped to make an informed buying decision that you won’t regret. What are AutoCrit pricing details? What integrations are available for AutoCrit? If you need more information about AutoCrit or you simply have a question let us know what you need and we’ll forward your request directly to the vendor.